The United States Constitution provides an umbrella of protections that people may not understand the importance of until they are in need of them. Some constitutional rights are there to protect you when facing criminal charges. For example, you have the right not to incriminate yourself and to have an attorney present when the police are interrogating you. In addition, you are protected from being personally searched or seized or having your property searched or seized in a variety of situations. Another important constitutional right that exists is the protection against being convicted of the same crime twice by the same governmental entity. This right is often referred to as the protection against double jeopardy. An experienced criminal defense attorney can help ensure that the police and prosecutor are not violating this important consitutional right. What Are Your Double Jeopardy Rights? Be punished for the same crime more than once in a single legal jurisdiction. Criminal cases. Double jeopardy protections only apply in criminal cases and not in civil or administrative proceedings. For example, double jeopardy would protect a person facing DUI charges from being charged with the same offense twice. However, if he also caused an accident while intoxicated that caused victims to suffer injuries or death, they would have the right to pursue a civil lawsuit against him for compensation for their injuries regardless of the outcome of the criminal case. Think of the O.J. Simpson case as an example of this because O.J. won the criminal trial, but was forced to pay the decedent's estate millions of dollars. Same offense. 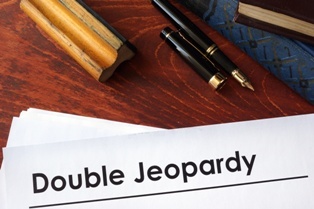 Double jeopardy protects a person from being charged with the same offense twice. However, this does not prohibit the person from being later charged with a lesser offense. However, do not take this to mean that because you have previously been convicted of theft, for example, that you can never be convicted of theft again. Rather, double jeopardy only protects the individual from being tried for the exact same situation and set of charges twice. In other words, if you commit a theft crime on January 1, 2018, and then commit a second theft crime on January 2, 2018, and you committed both crimes at the exact same location and stole the exact same thing, you could be tried and convicted of two theft charges. Attachment of jeopardy rights. A person is not protected against double jeopardy at the time of his arrest. A person only has the right against double jeopardy at a certain point in his criminal prosecution. In a jury trial, the right to this protection attaches when the jury is sworn in. Same jurisdiction. The double jeopardy protections only prohibit the same government or jurisdiction from recharging a person. This means that if a person is arrested for committing a federal crime and is acquitted, he may still be charged again under Virginia state criminal laws. Likewise, if an offense can be tried in two separate states, each state is entitled to try the individual in their respective jurisdiction without violating the protections created by the Double Jeopardy Clause. Termination of jeopardy. The criminal case must have concluded in a certain fashion for jeopardy protections to apply, such as an acquittal in a jury trial. If the jury cannot reach a unanimous verdict and is a hung jury, the prosecutor would be allowed to prosecute the case again. Similarly, a case may be brought again if it ends in a mistrial because of something that happened during the trial, unless there is evidence that the prosecutor intentionally sought to create a mistrial. Punishment. The prohibition against double jeopardy does not prohibit a prosecutor from charging a person with more than one crime based on the same criminal conduct. For example, if a person who has a concealed weapon and shoots it at a police officer, but misses, and the bullet instead hits a nearby onlooker, then the person could be charged with attempted capital murder for trying to shoot the police officer, aggravated malicious wounding for hitting the onlooker, concealed carry without a valid permit, and reckless handling of a firearm. If none of those are lesser included offenses of the others, then the defendant can receive punishments for each of those charges. If you are facing criminal charges, you need the help of an experienced criminal defense attorney to enforce your double jeopardy and other important constitutional rights. Even if you are guilty of the offense that you are being charged with committing, violations of your constitutional rights and other defenses can lead to the dismissal of the charges. Our experienced criminal legal team is here to aggressively build a strong defense to the charges you face. Call our office today to schedule your free consultation to learn more. What Factors Can Influence the Outcome of My Criminal Case?